Today being the New Year, a Holiday celebrated around the world, we thought we would post a festive recipe. This Gulab Jumaun recipe was taken from the very nice cooking web page Cooking with Kurma. I encourage you all to try this wonderful recipe on your friends and family. Gulab Jamuns are ideal confections for festive moments and entertaining. When guests are confronted with them for the first time they invariably ask, “What are they? ” Guesses then range from preserved fruits to doughnuts. In fact, Gulab Jamuns are made from just milk powder and flour. They’re fried slowly in ghee until the lactose in the milk powder caramelises and turns them a golden brown, and then they are soaked in a rose-scented, medium- heavy sugar syrup. Hence, the Hindi words Gulab Jamun meaning literally “rose ball”. This morning I was thinking what to cook for a Thanksgiving Offering. There was some confusion on the two calendars we have, because one said that today was Ekadashi (fasting day from grains and beans) and the other gave an alternate date of tomorrow for our location. But I decided to play it safe and observe Ekadashi with my menu planning. I decided it would be good to make a nice Tapioca Pudding (without eggs). 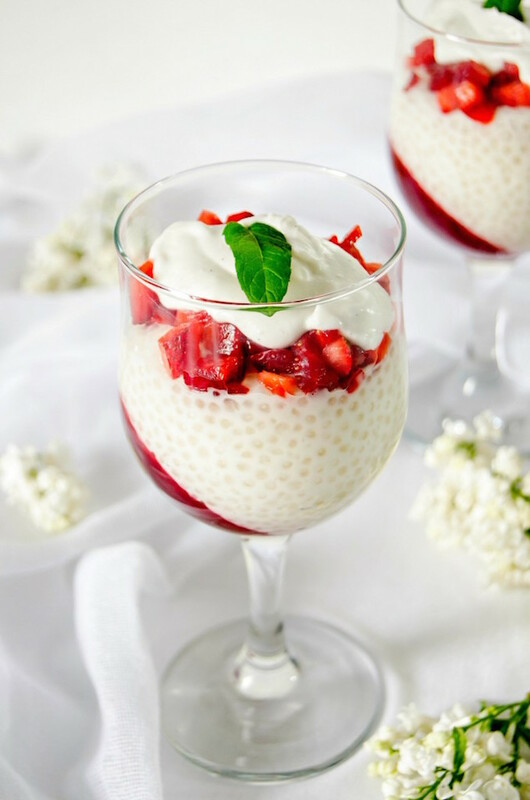 The beauty of this tapioca pudding is that it is egg-less and it does not need baking. It is cooked right on stove top with just three main ingredients: tapioca, milk and sugar. Just like that it tastes good but often it is further embellished with cashews, saffron and cardamom. Or you can use seasonal fruits to garnish. * Combine tapioca, milk & sugar in a medium/large saucepan and let sit for 5 minutes. * Bring to a slow boil over medium high heat. Stir the milk and tapioca and sugar frequently to prevent it from sticking to the bottom of the container. It thickens as it cooks but will still be a liquid. * Remove from heat and add vanilla. * Stir & allow to cool. It thickens as it cools. Note: Two tablespoons of tapioca for a cup of milk will give you a fairly thick pudding. If you want yours thin, use less tapioca or more milk. Same goes for sugar. A journey through India: border to border, bhoga to prasadam. The importance of golden ghee in cooking Krsna prasadam is very evident when we consider books of Vaisnava literature such as Sri Govinda-lilamrta and Sri Caitanya-caritamrta. 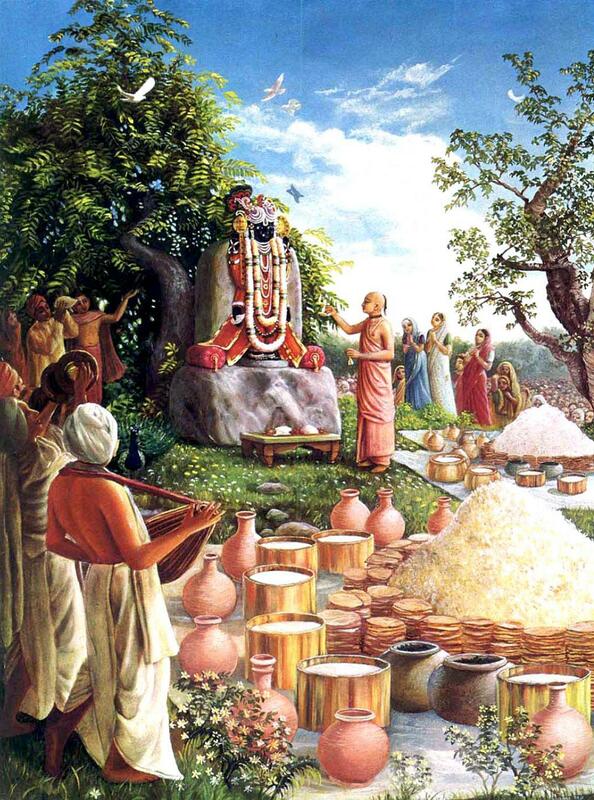 In Govinda-lilamrta we find descriptions of the great range of uses for ghee, as it’s described in the conversations between Mother Yasoda and the gopis who are arranging so many nice foodstuffs for Krsna. In Verse 53, Mother Yasoda is telling Kilimba that they had milked the cow named Sugandha, and churned her milk into butter, and the gopis could use this special butter to make ghee. Yashoda requests the gopis to make many different dishes cooked in ghee, and to prepare sweets with ghee, and Rohini Devi also describes the preparations Radharani has been making for Krsna with ghee. 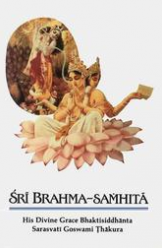 This morning I happened to visit the Sampradaya Sun web page. Rocan Prabhu has been doing a series entitled ” A journey through India: border to border, bhoga to prasadam” and in the last week has done a two part article on ‘Ghee’. We have reprinted both the first and second part here. …the Mother of all ingredients is milk, and all its glorious byproducts. 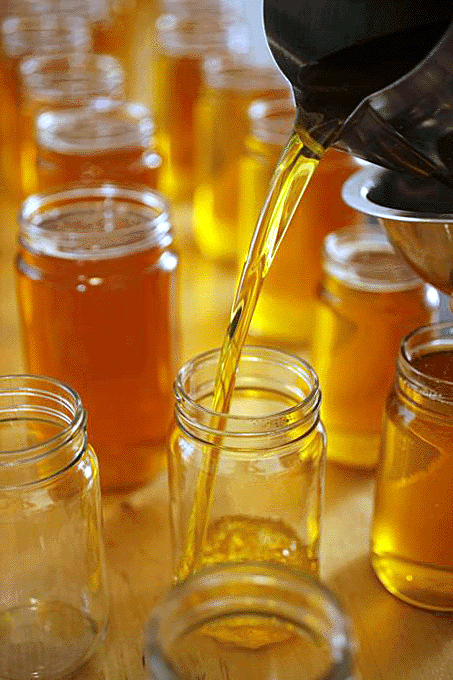 Today we’ll begin an exploration of ghee, which is one of the final foodstuffs derived from processing milk. Cow’s milk is said to possess the essential sap of all plants, and ghee is a most valued derivation of that nutritious stuff. 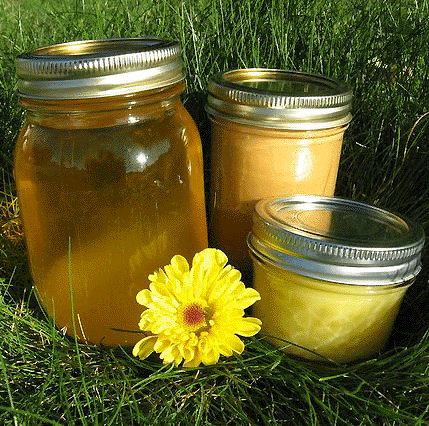 The clear golden liquid known as ghee is the crown jewel of oils, and is one of Srimati Radharani’s most favored ingredients. The word ghee comes from the Sanskrit ghrta [ghrit], or “sprinkled”. Aayurghritam means ‘ghee is life’, and this is reflected in the many sacred ways the stuff is used in devotional practice, from cooking to feeding the sacred fire, or performing abhisheka with panchamrta. Use of ghee as a substance to anoint the Deities is mentioned in Yajurveda, and the Rgveda has many references to butter and ghee. Today being Sunday, and with the weather cold and wet, I decided to stay indoors and practice my cooking, by learning how to cook Kachoris, which is basically a pastry with filling, for the Lord. I have never actually made them before, although I have eaten countless kachoris at various feasts. 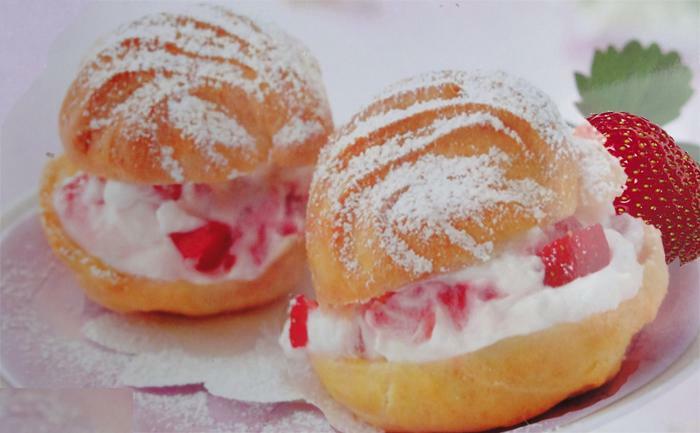 So I searched for some recipes in our cookbooks and on the Internet and found a nice selection of recipes for different types of Kachoris at harekrsna.com. 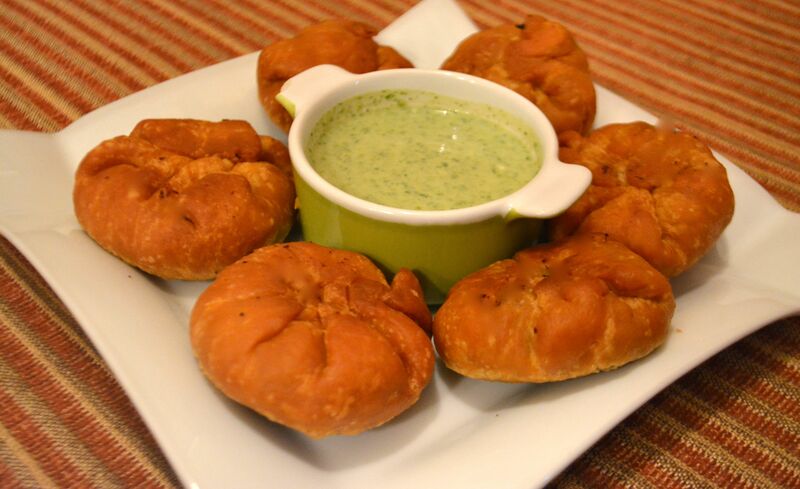 So I have posted many nice Kachori recipes or variations, and will pick one to cook today for our Sunday Feast. For years I have enjoyed eating Paratha’s (unleavened flat breads) at festivals, weddings, and other devotee gatherings, but have never actually learned how to cook them. So this weekend I took out the Indian Cookbooks and found a nice recipe and fried some up, and offered them to the Lord. They were easy to prepare, and very delicious. They can also be stuffed and we will explore this option in a later post. The following recipe I found on the Internet at tarladala.com, and the images are not mine but also gathered online. 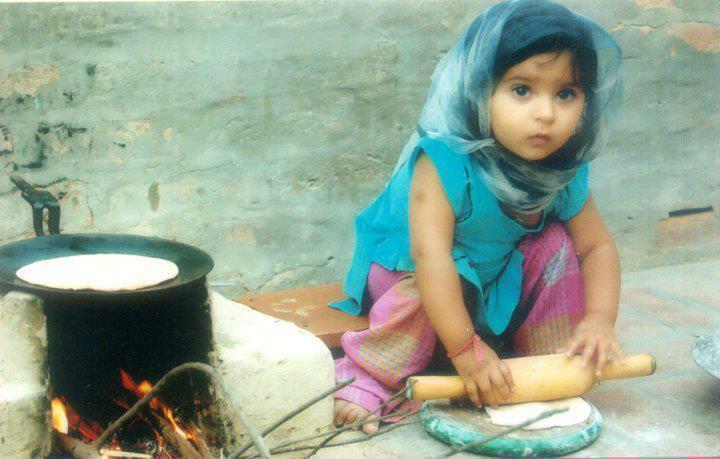 Also in this post is addition information on the history of Paratha’s. Divide the dough into 6 equal portions. Roll each portion into a 125 mm. (5″) diameter circle, using a little whole wheat flour for rolling, brush with melted ghee, fold into half to form a semi- circle. Brush the semi-circle with melted ghee and fold again to form a triangle. Roll out into a 125 mm. (5″) length triangular paratha using a little whole wheat flour for rolling. Heat a non-stick tava (griddle) and cook each paratha on both the sides, using a little ghee, till brown spots appear on both the sides. Repeat steps 3 to 6 to make 5 more parathas. …We should understand that in order to prepare nutritious food, we require only grains, ghee, yogurt and milk. ..Anna, ghṛta, dadhi and dugdha are food grains, ghee, yogurt and milk. Actually these are the basis of all food. Vegetables and fruits are subsidiary. Hundreds and thousands of preparations can be made out of grains, vegetables, ghee, milk and yogurt. …People are often frustrated with national food policies, but from the Vedic scriptures we find that if there are sufficient cows and grains, the entire food problem is solved. Today in the West people are celebrating “Thanksgiving”. 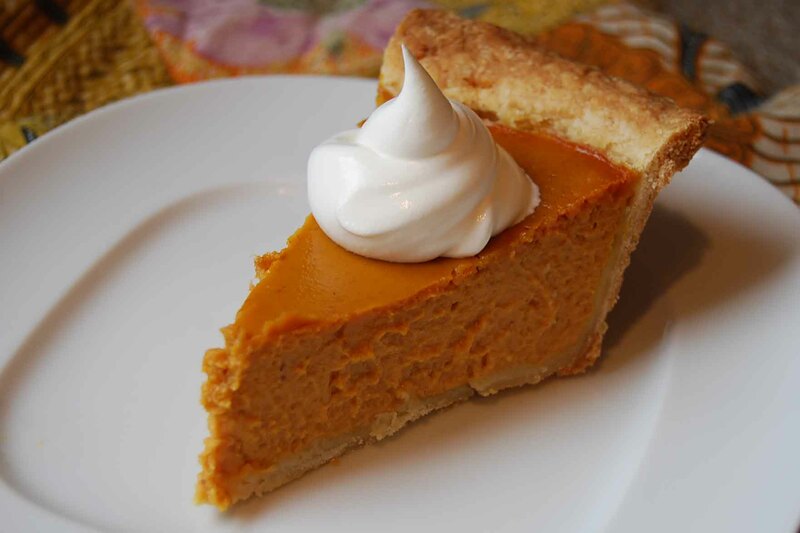 So we are posting a traditional Thanksgiving recipe; Pumpkin Pie (without the eggs). I have been making eggless pumpkin pies for the last 38 years, and have tried many different variations. I use 2 tablespoons of sour cream instead of 2 eggs, and one year I used Philadelphia cream cheese instead of evaporated milk, all with good success. 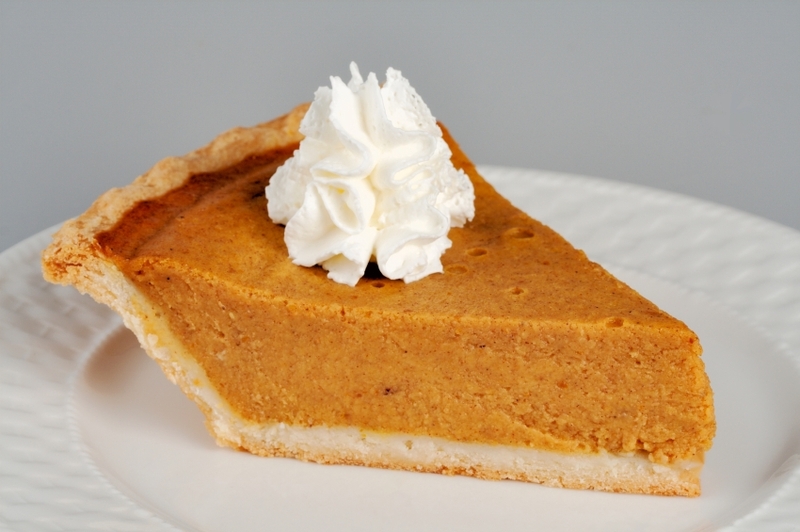 By the way, this year Thanksgiving falls on Ekadasi (fast from grains and beans), so we will be offering our pumpkin pie with a nut crust. 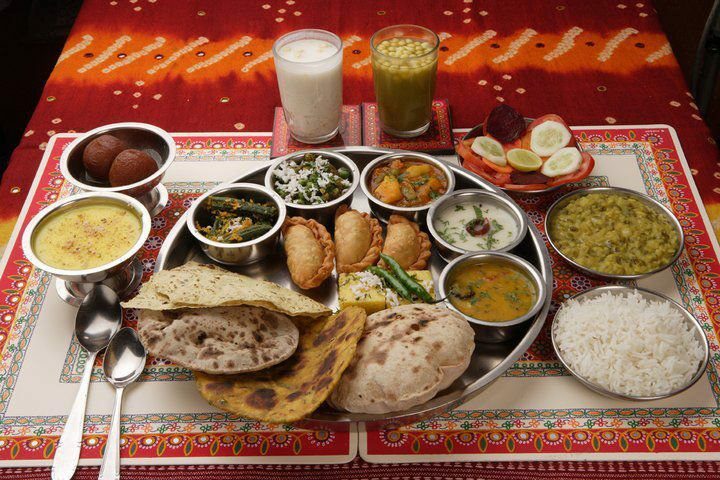 Once when Srila Prabhupada saw what was being served to the devotees, lavishly prepared multi-course lunches, he told the managers that it was too opulent. He said we should eat simply during the week with rice, dhal, chapatis and a little subji and once a week on the Sunday love feasts we could be more lavish. Today with more of us becoming Health Conscious, it is good to remember the very simple devotee diet that was recommended to us so long ago. Ran across this fine devotee cookbook on the Sampradaya Sun this morning, and thought we should share it with our readers. 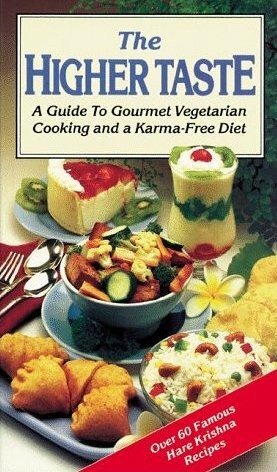 The recipes did in fact remind us of the early “love feasts”, and devotee diet in the early days of the Hare Krishna Movement. Very Nice! 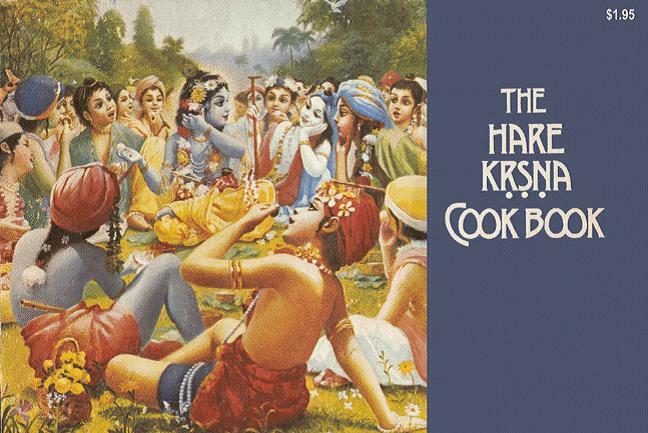 The following cookbook manuscript, which contains a wonderful collection of vintage Hare Krsna recipes, was handed to us several years ago by a devotee, who’d been carrying an old photocopy of it around for many years. While the manuscript doesn’t bear the author’s name, we’re told that it was likely compiled in the early 1970’s by Revatinanda dasa. A bit of the text was illegible, but the manuscript is reproduced below. Obviously the cookbook was written while Srila Prabhupada was still physically present. Judging from the language and recipes, our best guess is that it’s circa 1972-73. The recipes will be pleasurably familiar to devotees who remember the wonderful prasadam pastimes in ISKCON temples during the ‘early days’. While I was visiting the Prabhupada News web site the other day, I saw this extraordinary image of a Stuffed Puri and following recipe. I thought I would wait until after Ekadasi to re-post it. Puri is a whole wheat bread. This is a recipe especially popular among kids. Mix the flour and water together, adding water gradually until dough is soft but not wet, and can be kneaded. Knead the dough until it’s fairly soft (8 to 10 minutes). Cover and let dough rest for one hour. Sprinkle flour on rolling area and makes 1-1/2 inch balls out of dough. Flatten balls and roll out to about 4-5″ diameter. Place the chapati on a heated skillet (dry, free from oil) and cook until bubbles appear. Turn chapati quickly and let cook until bubbles appear again. Using tongs, remove chapati from pan, and hold over an open flame or burner to make it puff up. Heat it first on the side that was first cooked. You can lay directly on the burner for a brief moment, but don’t let it stick. When chapati puffs up, turn quickly and repeat on other side till it puffs. 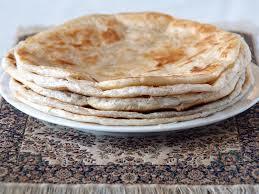 Remove, butter both sides, and cover with a clean cloth to keep in heat while remaining chapatis are cooked.